SEDALIA- Missouri Governor Jay Nixon (D) says he’s been talking to state lawmakers and to County Sheriffs, in an effort to keep the Legislature from overriding his veto of a comprehensive gun bill. Nixon told reporters Thursday at the State Fair that while he supports the Second Amendment, Senate Bill 656 would make Missouri less safe. “A few years ago we came together and put together a reasonable way to have training and public safety and power for local officials when it comes to conceal carry. And in a few limited situations where there is direct danger, we need to not take away that power from Sheriffs,” Nixon says. The Governor says Missouri’s system for granting concealed permits has been in place for more than a decade, adding that it’s worked. 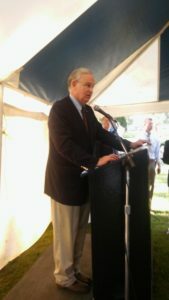 Nixon told reporters in Sedalia that he wants lawmakers to sustain his veto on the gun bill. “But I’m hearing from Sheriffs all across the state that they don’t think the Legislature should come into power and take away their power to keep their community safe,” Nixon says. While bill supporters say it would keep Missourians safe, Nixon says it would allow people with no training and no background check to carry concealed. However, bill sponsor State Sen. Brian Munzlinger (R-Williamstown) says those individuals can currently open-carry. He says his bill allows them to carry concealed. Senator Munzlinger tells Missourinet he plans to seek an override during the September Veto Session. Another supporter, State Rep. Chuck Basye (R-Rocheport), says he also intends to vote to override Nixon’s veto. Munzlinger’s bill includes numerous provisions, including self defense, a lifetime concealed carry permit, concealed carry permit fees and the County Sheriff’s revolving fund.